It wasn’t always pretty but the oblong ball fell Indiana’s way a couple times (after the Penn State game, IU was due) and Indiana held on for victory #5. The Hoosiers will probably need to play better to beat Purdue (and a LOT, LOT better to beat, or come close to beating, Michigan) but a win is a win and the postseason dream is still alive. Ramsey attempted just 28 passes, his lowest mark in conference play. In the process, he also recorded his highest yards per attempt average of his career at 8.7. He had completions of 35, 37, 25, and 43 and was intercepted just once. That came on an attempt to Luke Timian in the second quarter on a tipped pass. Ramsey faced heavy pressure on the play after Nick Linder was beaten by the pass rush. Walker had just 1 carry, a 2-yard gain in the 3rd quarter. Stevie Scott handled nearly all the running back work with 19 carries. Mike Majette also had a carry, his first since the Iowa game. Clearly getting Walker more work isn’t a priority and Scott hasn’t shown evidence of hitting a freshman wall. Walker was also potentially held back by Indiana’s low play count, just 58 on the day included 3 kneel downs. Unless something happens to Scott, expect Walker to be limited to a handful of carries per game. The redshirt freshman was unable to finish this one after injuring his knee in the second quarter. During his nearly 2 quarters of play, Hill was 4 of 12 for 43 yards and an interception. His replacement, Tyrrell Pigrome, went 10 of 13 for 146 yards and a touchdown. Maryland averaged 5.7 yards per play and a 38% success rate with Hill at QB and 7.0 yards per play and a 56% success rate with Pigrome. I don’t know if anyone can definitively say that Maryland would have won had they started Pigrome the whole game, but Maryland certainly moved the ball better with him behind center. Maryland RBs had a 51% opportunity rate, representing the percent of carries going for 5+ yards. That’s more than you’d normally want to see. 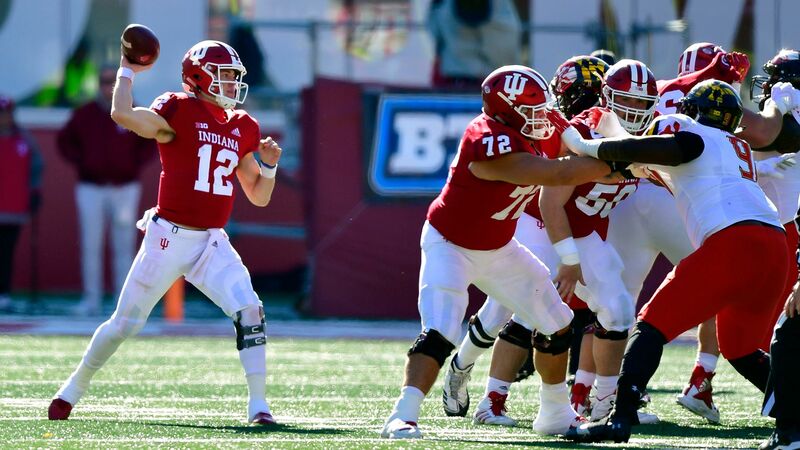 While IU allowed 13 of these carries to go for 10+ yards, there wasn’t an overabundance of huge plays. Granted the 6.2 highlight yards per opportunity is well above where Indiana’s backs have performed this year, but it fell short of Maryland’s season average. The Hoosiers rank 64th nationally in defensive rushing explosiveness. A kick return bonanza! With Maryland scoring 7 times on 3 touchdowns and 4 field goals, plus the start of the second half, there was plenty of opportunities for return. And while IU would normally be content to just down the ball, Maryland went the squib kick route forcing the Hoosiers to actually return the kicks. It didn’t work! Indiana fielded the return, on average, at the the 19.5 yard line making it not very difficult to get past the 25. In fact, even including the unsportsmanlike penalty against Thomas Allen, Indiana’s starting field position following these kickoff was the 35. I’m not sure why Maryland decided to adopt this strategy against a team willing to start at the 25, but I’ll take it. The Hoosiers won! But they didn’t cover. Oh well, I don’t think many people here are complaining. Indiana needs just 1 more win to guarantee a bowl game. Although if it happens, it probably won’t be this week. You have to be a registered user and logged in to play in this pool. We are going to be running the Over/Under Game through the site this year. © 2019 Punt John Punt. All rights reserved.